The picture on the right was taken about four years ago. 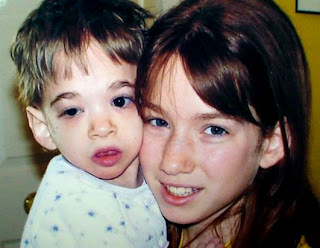 It is of Brooke Greenberg and her younger sister Carly. That's Brooke on the left, when she was 12 years old. She is now 16 and looks the same as she is depicted in the photograph. Doctors and researchers are stymied at how Brooke has hardly aged at all since she was born. She still has her baby teeth, and her bones are considered to be of a child who is no older than ten. Her mental capacity is said to be that of an infant. But her family maintains that in many other aspects she is just like any other teenage girl (she likes to shop, f'rinstance). Click here for more about Brooke Greenberg and her family.